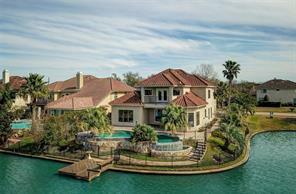 PRISTINE, STUNNING two sided waterfront Mediterranean style house with infinity pool, in prestigious Windsor Park Lakes, a manned gated subdivision with a resort style living w/ lakes where boating and fishing is allowed. QUALITY CONSTRUCTED 2004 built house with an open concept living/dining/family room opened to the kitchen and breakfast room with SPECTACULAR lake views. Granite counters in kitchen with SS appliances. The Master Bedroom is conveniently on the 1st floor with huge windows looking out to the pool/patio area and lake. Master bathroom retreat with whirlpool tub, separate spacious shower stall and his and hers vanities. Enormous Master closet with built ins/shelves/drawers. 2nd floor with newly installed engineered wood floors and carpet with 3 spacious bedrooms and bathroom. Fully fenced all the way to the lake perfect for kids/pets. Quick access to I-10 for easy commuting to Energy Corridor, Galleria, downtown, shops & restaurants. EXCELLENT KATY SCHOOLS. Welcome home! !